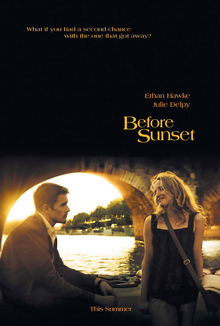 Before Sunset is a 2004 American romantic drama film, the sequel to Before Sunrise (1995). Like its predecessor, the film was directed by Richard Linklater. He shares screenplay credit with actors Ethan Hawke and Julie Delpy, and with Kim Krizan, the screenwriter for the first film featuring these two characters. The film picks up the story in Before Sunrise of the young American man (Hawke) and French woman (Delpy) who spent a passionate night together in Vienna. Their paths intersect nine years later in Paris, and the film appears to take place in real time as they spend an afternoon together. Before Sunset received broad critical acclaim and has appeared on many publications' lists of the best films of the 2000s. It was nominated for an Academy Award for Best Adapted Screenplay. The directors and lead actors collaborated on another film following these characters, Before Midnight, which was released in 2013 and also gained acclaim. Nine years prior, Jesse Wallace, an American tourist, and Céline, a university student from Paris, met on a train and had a brief encounter in Vienna. Jesse's new novel, This Time, was inspired by that night, and becomes a bestseller. During a book tour in Europe, he does a reading at the noted bookstore, Shakespeare and Company, in Paris. Flashbacks express elements of his time with Céline in Vienna. Three journalists attend the reading to interview Jesse: one is convinced the book's main characters meet again, another that they do not, and a third who wants them to but is doubtful that will occur. As Jesse speaks with the audience, his eyes wander and he sees Céline there, smiling at him. After the presentation, the bookstore manager reminds Jesse of his need to leave for the airport in about an hour for his plane. Céline and Jesse's time together is again constrained. They decide to make the best of it, and their conversations soon become deeply personal. They begin with themes of work and politics and, with increasing passion, approach their earlier feelings for each other, eventually touching on their failure to have met as planned six months after their first encounter. Jesse initially lies and says that he had not returned to Vienna after Céline says she did not, because her grandmother had died suddenly. After Céline asks him why he didn't, he confesses that he in fact did return. Since the pair had never exchanged phone numbers, they had no way to contact each other at the time. They reveal how their lives have changed during the nine years they spent apart. Jesse is married and has a son named Hank while Céline has become an advocate for the environment and has a photojournalist boyfriend. They each express dissatisfaction with their lives as they walk in Paris, and their former feelings are slowly rekindled, as their one night together looms large in memory, unmarred by ordinary trials. Jesse says his book was inspired by his hope of seeing Céline again and she says that it brought back painful memories. They begin to approach each other tentatively but pull back. Céline and Jesse arrive at the former's apartment, even after continuous insistence that Jesse should go before he misses his plane. Jesse persuades her to play a waltz on her guitar, which is about their earlier brief encounter. Jesse puts a Nina Simone CD on the stereo system, prompting Céline to dance to the song "Just in Time" as he watches her. Céline imitates Simone, saying, "Baby ... you are gonna miss that plane." Jesse smiles and says, "I know." After the filming of Before Sunrise, Linklater, Hawke, and Delpy discussed making a sequel. Linklater considered a version to be filmed in four locations and with a much larger budget. When his proposal did not secure funding, he scaled back the concept of the movie. In a 2010 interview, Hawke said that the three had worked on several potential scripts over the years. As time passed and they did not secure funding, they adapted elements of the earlier scripts for Before Sunrise in their final draft of Before Sunset. We sat in a room and worked together in about a two- or three-day period, worked out a very detailed outline of the whole film in this sort of real-time environment. And then, over the next year or so, we just started e-mailing each other and faxing. I was sort of a conduit – they would send me monologues and dialogues and scenes and ideas, and I was editing, compiling and writing. And that's how we came up with a script. Hawke said, "It's not like anybody was begging us to make a second film. We obviously did it because we wanted to." The movie was filmed entirely on location in Paris. It opens inside the Shakespeare and Company bookstore on the Left Bank. Other locations include their walking through the Marais district of the 4th arrondissement, Le Pure Café in the 11th arrondissement, the Promenade Plantée park in the 12th arrondissement, on board a bateau mouche from Quai de la Tournelle to Quai Henri IV, the interior of a taxi, and finally "Céline's apartment." Described in the film as located at 10 rue des Petites-Écuries, it was filmed in Cour de l'Étoile d'Or off rue du Faubourg St-Antoine. The movie was filmed in 15 days, on a budget of about US$2 million. The film is noted for its use of the Steadicam for tracking shots and its use of long takes; the longest of the Steadicam takes lasts about 11 minutes. As the summer was one of the hottest on record, the cast and crew suffered along with the city residents, as temperatures exceeded 100 degrees F (38 °C) for most of the production. The film is notable for essentially taking place in real time, i.e. the time elapsed in the story is the run time of the film. In the fast-changing temperate Paris climate, this created challenges for the cinematographer Lee Daniel to match the color and intensity of the skies and ambient light from scene to scene. The scenes were mostly shot in sequence, as they were still developing the screenplay. Producer Anne Walker-McBay worked with less time and less money than she had on Before Sunrise, but still brought the film in on time and on budget. The sequel was released nine years after Before Sunrise, the same amount of time that has lapsed in the plot since the events of the first film. The film was released in the wake of Hawke's divorce from Uma Thurman. Some commentators drew parallels between Hawke's personal life and the character of Jesse in the film. Additional comment has noted that both Hawke and Delpy incorporated elements of their own lives into the screenplay. Delpy wrote two of the songs featured in the film, and a third by her was included in the closing credits and movie soundtrack. Before Sunset premiered at the Berlin International Film Festival in February 2004, and received a limited release in the United States on July 2, 2004. In its opening weekend, the film grossed $219,425 in 20 theaters in the United States, averaging $10,971 per theater. During its entire theatrical run, the film grossed $5.8 million in the United States and nearly $16 million worldwide. Before Sunset received wide acclaim from critics. It held a 95% favorable rating at Rotten Tomatoes based on 172 reviews, and was assigned a weighted average score of 90/100 by Metacritic based on 39 reviews from mainstream publications, indicating "universal acclaim". The film appeared on 28 critics' top 10 lists of the best films of 2004, and took the 27th spot on Metacritic's list of The Best-Reviewed Movies of the Decade (2000–09). In comparing this film with the first featuring these characters, American film critic Roger Ebert wrote, "Before Sunrise was a remarkable celebration of the fascination of good dialogue. But Before Sunset is better, perhaps because the characters are older and wiser, perhaps because they have more to lose (or win), and perhaps because Hawke and Delpy wrote the dialogue themselves." In her review for the Los Angeles Times, Manohla Dargis lauded the film as a "deeper, truer work of art than the first," and praised director Linklater for making a film that "keeps faith with American cinema at its finest." Both Hawke and Delpy are excellent and their performances have real depth. This time, too, they're doing more than appearing as fictional creations in a Richard Linklater film. They now share the writing credit with him and are clearly putting much of their experiences of the past decade into characters they have possessed and been possessed by. Can't they just say what they mean? Can you? Language, after all, is not just about points and meanings. It is a medium of communication, yes, but also of avoidance, misdirection, self-protection and plain confusion, all of which are among the themes of this movie, which captures a deep truth seldom acknowledged on screen or in books. In the United Kingdom, the film was ranked the 110th-greatest movie of all time by a 2008 Empire poll. In 2010, the critics at The Guardian placed Before Sunrise/Before Sunset at number 3 in their list of the best romantic films of all time, and called the ending of Before Sunset "one of the most tantalising and ingenious endings in all cinema." As noted by Metacritic, the film appeared on the following critics' top 10 lists of 2004. 2004 77th Academy Awards – Best Writing (Adapted Screenplay) for Richard Linklater, Ethan Hawke, Julie Delpy, and Kim Krizan. 2005 Writers Guild of America Award – Best Adapted Screenplay for Richard Linklater, Ethan Hawke, Julie Delpy, and Kim Krizan. In a 2016 BBC poll of 177 critics worldwide, Before Sunset was voted the 73rd best film since 2000. Linklater, Hawke, and Delpy all discussed the possibility of a sequel to Before Sunset. Hawke said he wanted to develop the relationship between Jesse and Céline, and said, "I'll be shocked if we never make another one". In a video interview in November 2011, Hawke said that he, Delpy and Linklater "have been talking a lot in the last six months... all three of us have been having similar feelings that we're kind of ready to revisit those characters... there's nine years between the first two movies... if we made the film next summer, it would be nine years again, so we started thinking that would be a good thing to do. So we're going to try and write it this year." In June 2012, Hawke confirmed that the sequel to Before Sunset would be filmed in summer 2012. In September 2012, it was announced the sequel, entitled Before Midnight, had completed filming and would premiere at the Sundance Film Festival in January 2013. The film was released in May to widespread acclaim, and received an Academy Award nomination for Best Adapted Screenplay. ^ "BEFORE SUNSET (15)". British Board of Film Classification. May 27, 2004. Retrieved April 25, 2013. ^ a b "Before Sunset (2004)". Box Office Mojo. Archived from the original on November 26, 2009. Retrieved December 28, 2009. ^ a b c Ross, Matthew. "Paris by Day". FilmMaker (Spring 2004). Independent Filmmaker Project. Archived from the original on August 18, 2012. Retrieved July 5, 2012. ^ a b Weintraub, Steve "Frosty" (January 4, 2010). "Ethan Hawke on a 3rd BEFORE SUNRISE/BEFORE SUNSET Movie". Collider.com. Retrieved July 1, 2012. ^ Macnab, Geoffrey (October 8, 2005). "Forget me not". The Guardian. London, England. Retrieved August 10, 2007. ^ a b c Marshall, Lee (July 19, 2004). "Love that goes with the flow". The Daily Telegraph. London, England. Retrieved August 11, 2007. ^ Halpern, Dan (October 8, 2005). "Another sunrise". The Guardian. London, England. Retrieved December 28, 2009. ^ Said, S.F. (July 9, 2004). "Keeping the dream alive". The Daily Telegraph. London, England. Retrieved August 11, 2007. ^ "Before Sunset". Rotten Tomatoes. Retrieved April 5, 2011. ^ "Before Sunset". Metacritic. Retrieved November 19, 2009. ^ a b "Metacritic: 2004 Film Critic Top Ten Lists". Metacritic. Archived from the original on May 27, 2008. Retrieved February 13, 2011. ^ "The Best Movies of the Decade". Metacritic. Archived from the original on May 3, 2011. Retrieved April 5, 2011. ^ Ebert, Roger (July 2, 2004). "Before Sunset Review". Chicago Sun-Times. Retrieved December 28, 2009. ^ Dargis, Manohla (July 2, 2004). "'Before Sunset' – Movie Review". Los Angeles Times. Archived from the original on May 23, 2008. Retrieved February 13, 2011. ^ Travers, Peter (June 16, 2004). "Before Sunset : Review : Rolling Stone". Rolling Stone. Retrieved April 30, 2011. ^ French, Philip (July 25, 2004). "Brief re-encounter". The Observer. London, England. Retrieved December 28, 2009. ^ Scott, A. O. (July 2, 2004). "FILM REVIEW: Reunited, Still Talking, Still Uneasy". The New York Times. Retrieved December 28, 2009. ^ "Empire Features – 500 Greatest Movies of All Time". Empire. Retrieved January 25, 2010. ^ Gilbey, Ryan (October 16, 2010). "Before Sunrise/Before Sunset: No 3 best romantic film of all time". The Guardian. London, England. Archived from the original on February 1, 2011. Retrieved January 12, 2011. ^ "The 21st century's 100 greatest films". BBC. August 23, 2016. Retrieved January 11, 2017. ^ Weintraub, Steve "Frosty" (November 24, 2009). "Exclusive: Richard Linklater on BEFORE SUNRISE, BEFORE SUNSET, and Would They Ever Make a Third Film". Collider.com. Retrieved July 1, 2012. ^ Applebaum, Stephen (June 11, 2010). "Ethan Hawke joins the NYPD and leaves criminals star-struck". The Independent. London, England. Retrieved July 1, 2012. ^ Vary, Adam B. (January 25, 2012). "Sundance: Chris Rock and Julie Delpy on '2 Days in New York', a 'Before Sunset' sequel, and Spike Lee's infamous tirade". Entertainment Weekly. Retrieved July 1, 2012. ^ Adler, Shawn (July 5, 2007). "Ethan Hawke Laments Lost 'Before Sunset' Threequel". MTV News. Retrieved July 1, 2012. ^ Wood, James (June 11, 2005). "The last word". The Guardian. London, England. Retrieved July 1, 2012. ^ Baronnet, Brigitte (November 18, 2011). "Ethan Hawke, l'interview blind-test (filmed November 2, 2011)". AlloCiné. Retrieved July 1, 2012. ^ Shoard, Catherine (November 23, 2011). "Ethan Hawke and Julie Delpy wake up to possibility of Before Sunrise sequel". The Guardian. London, England. Retrieved July 1, 2012. ^ Smith, Nigel M. (June 13, 2012). "'The Woman in the Fifth' Star Ethan Hawke Gets Personal and Talks 'Before Sunset' Follow-Up". IndieWire. Retrieved July 1, 2012. ^ Knegt, Peter (September 5, 2012). "Richard Linklater, Julie Delpy and Ethan Hawke Complete 'Before Midnight'; Set 2013 Release". IndieWire. Retrieved September 6, 2012. ^ "Before Midnight (2013)". Rotten Tomatoes. Retrieved January 20, 2014. ^ "86th Academy Awards Nominations: Complete List and Scorecard". Variety. January 16, 2014. Retrieved January 20, 2014.